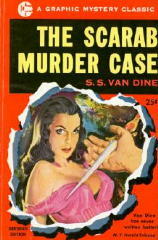 » A Review by Mary Reed: S. S. VAN DINE – The Scarab Murder Case. 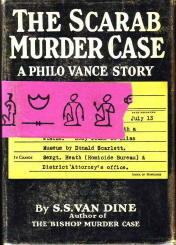 A Review by Mary Reed: S. S. VAN DINE – The Scarab Murder Case. S. S. VAN DINE – The Scarab Murder Case. 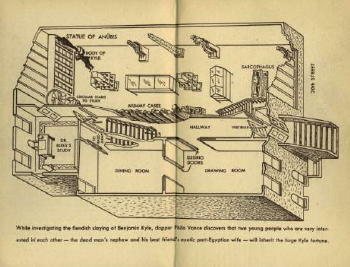 Philanthropist Benjamin H. Kyle is found murdered in a private museum run by Egyptologist Dr Mindrum Bliss. Philo Vance becomes involved when Donald Scarlett, a British college friend now working for Dr Bliss, arrives in a terrible haste. Scarlett had gone to the museum, discovered Kyle’s body, and then left rapidly because he did not want to get involved. He has come to Vance for help. DA John Markham and his police department cohorts are soon on the job, assisted by Vance. It transpires Kyle was funding Bliss’s Egyptian expeditions and when found is clutching a financial document drawn up by Bliss, whose scarab cravat pin is on the floor nearby. It looks bad, especially given the only fingerprints on the statuette that crushed Kyle’s head belong to Bliss, and so does a shoe with a bloody sole. Is it an all too obvious attempt to pin the murder on him? If so, why? Suspects include half-Egyptian Mrs Meryt-Amen Bliss, who is a lot younger than her husband, and her Egyptian servant Anupu Hani, who insists Dr Bliss’s excavations are sacrilegious tomb plunderings. Assistant curator Robert Salveter, Kyle’s nephew, not only seems overly interested in Mrs Bliss but will receive a large inheritance under Kyle’s will. The servants seem a shifty pair as well — Dingle, the cook, who hints she may know more than she lets on, and butler Brush, who goes about looking terrified. 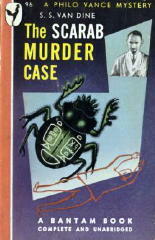 My verdict: The Scarab Murder Case is a book or two into the Vance series and his verbal embroidery has toned down considerably although still retaining his distinctive “voice”, while the narrator’s footnotes proliferate as usual. Markham is now a personal friend of Vance’s, remaining rather a Doubting Thomas when it comes to the psychology of criminals, Vance’s preferred method of solving crimes. Fortunately Vance is extremely knowledgeable in matters ancient Egyptian, which also comes in very handy in this instance. Those keen on Egyptology will enjoy certain nuggets of interest strewn here and there, although overall the pace of the novel is slow. I guessed the identity of the culprit and suspect many readers will too, but as for proving it, ah, that is a task only Philo Vance could accomplish, and accomplish it he does despite the clouds of ever-present cigarette smoke and various devilish machinations.